Opening times: 10.00 to 16.30 Monday to Saturday (closed on Sundays). The last admission is 30 minutes prior to closing time. Tours operate daily at 11.00, 11.30, 14.30 and 15.00. The Opera Garnier operates throughout the year. 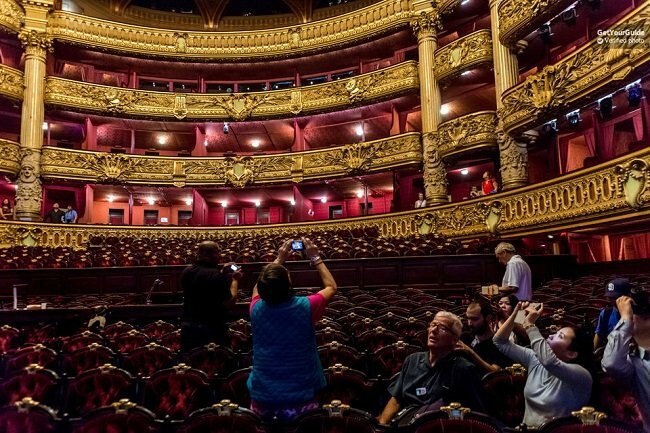 We are comparing Opera Garnier Guided Tour Tickets Prices from leading ticket suppliers and Try to find you Cheap tickets prices on the market. The Opera Garnier is the largest opera house in Europe and also one of the most beautiful. This baroque masterpiece was the place to be for the Parisian fashionistas of the 19century. Officially opened in 1875, the theatre was named after it’s architect, Charles Garnier. This 2,000-seat opera house was originally built for Napoleon III and the construction took more than 10 years to complete. During the tour you will visit the Grand Foyer, climb the marvellous double marble staircase, and visit the Rotunda de Abonnes where the opera guests would chatter socialise before the start of the show. You’ll also get to see fantastic bronze sculptures and finely painted portraits. For lovers of drama, theatre, music, dance, and of course, opera. This historic opera house with entice anyone with an interest in the fine arts, inside you can browse statues, paintings and the majestic auditorium. This guided tour is family friendly and suitable for groups or individual. The venue is also suitable for disabled visitors. Your Experience With Opera Garnier Guided Tour Tickets? Take a comprehensive guided tour of Paris’ favourite opera house. Explore the public areas of the theatre which inspired the hit musical Phantom of the Opera. Walk beneath a 7-ton chandelier and climb the grand staircase. Let your bilingual guide fill you in on the many famous musicians, dancers, actors and singers who have performed on the stage of the Opera Garnier. Marvel at the details of the Chagall ceiling inside the luxurious auditorium. Listen carefully as your live guide unlocks the secrets of Opera Garnier. What Opera Garnier Guided Tour Tickets Includes? 90 Minute tour of the Opera Garnier, including the Grand Foyer, Lounges, Auditorium, Grand Escalier, and Rotunda. Audio equipment (to hear your guide clearly). If you would like to visit the Opera House Auditorium then you can double check online that it will not be closed on your day of visit. A self-guided visit to the Opera Garnier is also available for people who prefer to explore at their own pace. Travelers Reviews about Opera Garnier Guided Tour Tickets? Both the guided and the self-guided tour of the Opera Garnier have been highly recommended by TripAdvisor users who gave the attraction and overall 4 out of 5-star rating. Comments agree that the interior of this historic opera house is worth taking a look at. Visitors have described the venue as an extraordinary space and very artfully decorated. On Viator the guided visit also has a 4.5-star rating but on Get Your Guide travellers have given the tour a fantastic 4.7 out of 5 from over 1,000 reviews. Travellers have said that the tour guides are wonderful and that the content if fascinating. The Opera Garnier is wheelchair accessible. Your online voucher will be delivered via email. Please bring your printed or electronic voucher to the entrance desk. Full or partial refunds may be available up to two days in advance for tickets purchased from certain providers but please check the cancellation policy of your chosen ticket supplier. Some ticket providers have non-refundable cancellation policy. The auditorium may be closed to visitors on some occasions due to artistic and technical reasons, therefore it will not be possible for the guided tour to enter on these days. Children under the age of 5 will now be able to join the tour. You will be provided with audio equipment so that you can hear your guide clearly throughout the tour. You will need to bring a valid ID to leave as a guarantee for the device. Meeting Point: go to the entrance of the Opera Garnier. Address: 8, Rue Scribe, 75009, Paris. Direction: you can take the metro, bus, or RER to any Opera Garnier station.